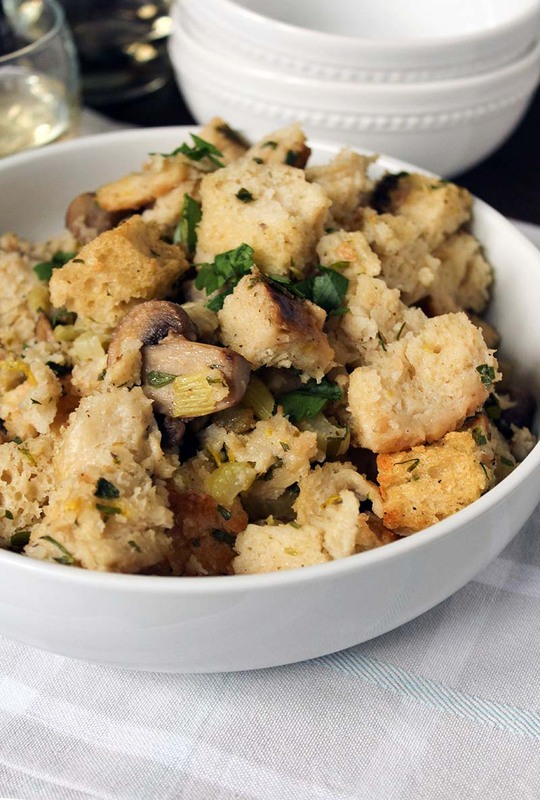 A no-fuss homemade crusty bread makes this stuffing recipe the star at any Thanksgiving table. Full of flavor and texture this simple stuffing will be your go-to side year after year. In a large mixing bowl combine flour, yeast, salt and sugar. Slowly mix in water until ingredients are combined. Cover with cling wrap and set aside overnight. On a flour dusted counter turn out dough and lightly knead into a round ball. Using sharp knife, lightly cut two lines across the dough to make an 'X'. Place Dutch oven in the oven for 30 minutes to heat up. Remove Dutch oven from the oven. Place dough in Dutch oven - being very careful not to burn yourself! Bake for 30 minutes covered. Remove cover with hot pads, and bake an additional 10 minutes uncovered. Remove from oven and let cool for 15 minutes. Remove bread from Dutch oven and finish cooling on wire rack. Let bread set on counter overnight (or up to 2 days). Cut slightly stale bread into bite sized cubes. About 6-7 Cups. Place cubes on a large baking sheet in a single layer and bake for 10 minutes. In a large pan melt butter. Add in onions, celery, mushrooms and sauté until slightly tender. Sprinkle with salt, pepper. Add in chicken broth. Remove from heat. Add in parsley. In a 9x13 buttered baking dish, combine vegetables and bread with your hands. Add in more chicken stock if needed. Bread should be moist with a little bit of stock in the bottom of the dish. Place in oven and bake for 30-40 minutes until golden brown. Remove from oven and garnish with additional parsley.